Now people of other nations and ethnicities are coming to America, looking for opportunities to start over, raise their family, receive education or just live to see another day. This has wonderful implications on the gospel and missions efforts, because now the very people that we’ve been trying to reach are our neighbors. But instead of reaching out to them, inviting them into our churches, our homes, our lives, many Christians and churches are pushing them away. The reality is that these immigration trends are causing the browning of America. Whereas people of color, non European immigrants, and indigenous people used to be the minority in terms of numbers, we are increasingly becoming the majority. For the first time ever, the majority of babies born in the United States are born to parents of color. This has implications not only on how our society is governed, meaning that we need to adopt more inclusive and racially just practices and policies, but it also suggests something for our churches. What it purports is that if our churches fail to do ministry with and alongside of people of color, these nations that now live within our border, we run the risk extinction (in America, not globally). In 50 years, more than half of all adults in America will be people of color and immigrants. If our churches fail to make disciples of the nations living amongst us in meaningful, authentic, non colonial, non token ways, we will quickly become a post-Christian nation. To be clear, the onus will not be on those ‘unbelievers’ who failed to accept Christ; it will be on the American church and its failure to represent Christ and bring people who are far away near. Now when I say the word ‘disciple,’ I am not just talking about people who will come to church every Sunday, fill the pews and give their tithes and offering. While that is important, what is equally important (if not more so) is that our churches are training people from the nations to actually minister the gospel. Are they training them to be pastors, preachers, leaders, ministers, evangelists, teachers, and missionaries? Are they training them to go and make disciples? Are they nurturing their gift? Or are they sitting on those gifts, making them jump through hoops that they never had to, to prove what they never had to prove, to serve a God who is equally available to all? This is important because it will be these people who will continue to carry the gospel forward, from generation to generation until Jesus comes again (sidenote: I am not just talking about paid clergy. It is important for the entire body of believers to be built up in this way). “Make disciples of all nations.” This is the charge that Jesus has given the Church. Interestingly enough, the church in America is now poised in a similar situation to the first century church in Jerusalem. If you read the second chapter of Acts, you will see how the nations of the world were in Jerusalem for one reason or another, heard the gospel in a culturally relevant way, and then put their faith in Christ. 3,000 people from different nations and tongues were added to the church in one day. And I have to believe that it was these people, along with the apostles, who were responsible for carrying the gospel into the world. If we are careful, America could become ‘A New Jerusalem; – a place of discipling, equipping and sending forth. But it will have to start with the church welcoming the nations, as well as the people of color who have been here for centuries, instead of pushing them away. The response of the Church will be a determinant as to whether the influx of non European nations into the America society will be transgenerational blessing or a lost opportunity. Ebony Adedayo was born in 1983 in Milwaukee, WI. She moved to the Twin Cities in 2001 to attend college, and earned a B.A. in Pastoral Studies (Cross Cultural minor) from North Central University in 2006, and a Master of Global and Contextual Studies from Bethel Seminary in 2010. 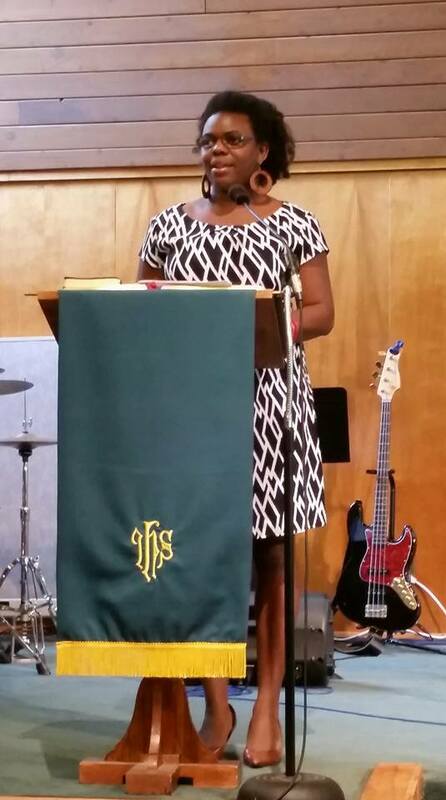 A licensed minister, she has served with youth, young adults, and in missions ministry. Ebony is passionate about the intersection of faith, justice, and reconciliation and is the author of Dancing on Hot Coals and Embracing a Holistic Faith: Essays on Biblical Justice, and blogs at www.ebonyjohanna.com. You can also find her on twitter at @ebonyjohanna.